I'm a nature girl at heart. I spent summers hiking with my family, spent all of college working as a camp counselor and rock climbing instructor, and generally get good vibes from being outside in the woods. 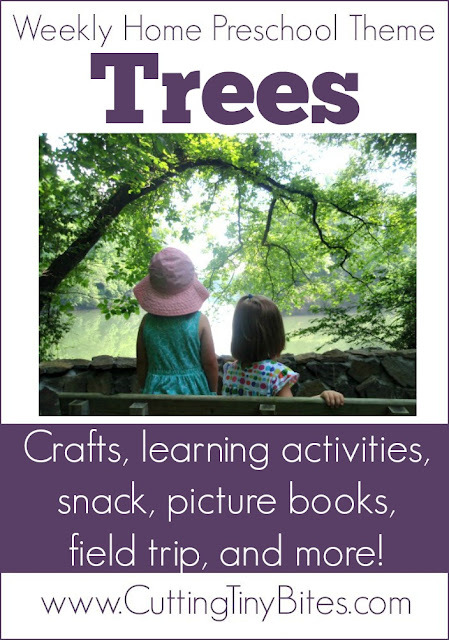 My girls love being outside too, so this week we enjoyed a Tree Theme Preschool Week. Here's what we got up to! We took a quick tour of our yard and I let the girls each pick one leaf off of each of our trees. 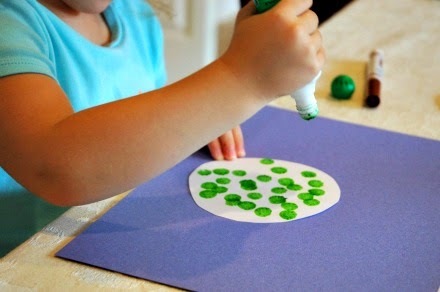 Then, I taped a piece of paper over the leaves, to prevent slipping, and showed the girls how to rub the flat edge of a crayon over the leaf to make an imprint. 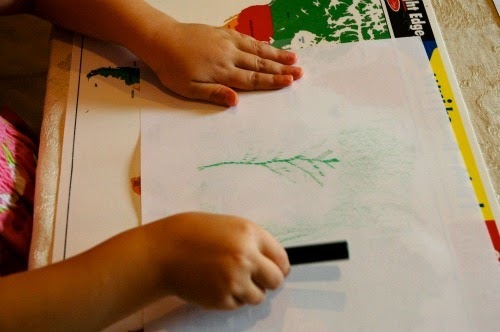 Lena was frustrated at first when she couldn't quite get the whole leaf to show up, but seemed proud of herself when I showed her how to turn the crayon and come at it from different angles to try to get it all. I also pointed out the veins in the leaves, and that they were the 'pipes' that the leaves used to get their food and water. I also had Lena practice writing and sounding out words with this activity. I told her what kind of tree each leaf was from and helped her spell it out. She labeled all of her rubbings. 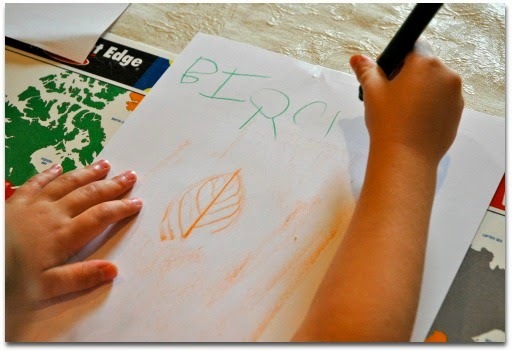 This four seasons tree was quick and easy, used materials we had on hand, and allowed Lena to practice cutting and stapling (which she loves) and Maggie to practice coloring and using the dot markers properly. I just cut out four circles of white cardstock, one to represent each season. I gave the girls markers and dot markers and let them decide how to decorate each season. Then I helped Lena staple each circle to the toilet paper tube, and then staple the tops fo the trees to one another. They were our very sophisticated table decorations for the whole week. 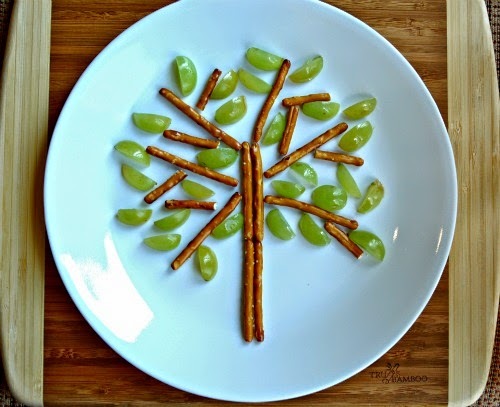 This was a really easy snack to make for tree week that used things we already had around. I just made a basic tree shape out of pretzals, cut some grapes lengthwise, and had the girls put their leaves on the tress. Then we ate them! The original idea for this snack was from Fantastic Fun and Learning. I pulled out one of our my very favorite books to use this week. Miss Maple's Seeds by Eliza Wheeler is a story that makes me tear up every time, and has beautiful artwork to go along with it. While it is more about seeds than it is about trees, Miss Maple herself lives inside an old maple tree, so we went with it. We got it as part of Dolly Parton's Imagination Library, but I can't recommend it highly enough for your own home library. I even bought a copy for some family members who aren't eligible for Dolly's program. Miss Maple travels the world, looking for lost seeds. Then she brings them home where she loves and nurtures them, and teaches them the ways of the world. In the spring she lets them go, reminding them to, "Take care, my little ones. For the world is big and you are small." 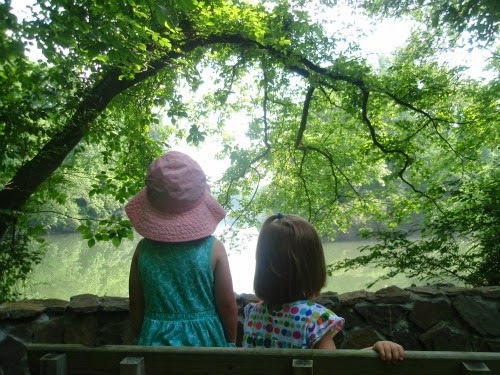 My kids have no idea that it is about more than seeds, but its message is sophisticated enough that adults will enjoy the gentle reminders about our role as parents in our children's lives. The artwork, also done by Eliza Wheeler, is soft and whimsical. 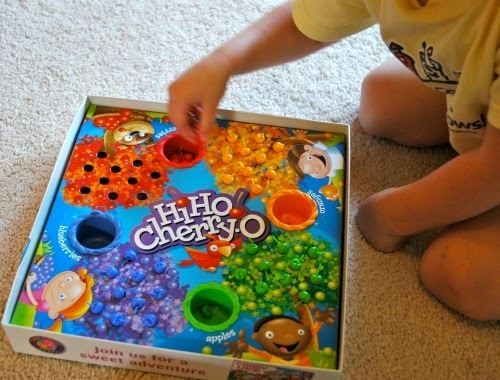 The classic preschool game, HiHo! 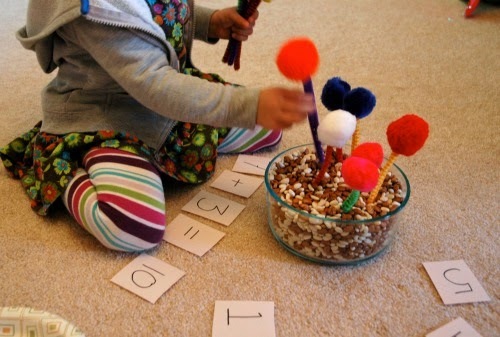 Cherry-O is a great way to practice counting with little ones. Maggie practiced her counting. Lena practiced her patient-big-sistering. 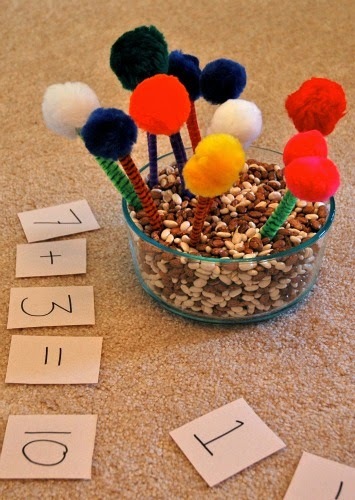 We also did this great Lorax math activity from Inspiration Laboratories that was a big hit. I folded striped pipe cleaners in half (to keep the pokey ends out of the way) and hot glued big pompoms to the top, to make truffula trees. Then I took a small-ish container and poured in some dried beans from a sensory bin. I made simple number cards, along with addition, subtraction, and equal signs. Then I set up a simple math problem and had Lena count the correct number of truffula trees, plant them in the dirt (beans) and solve the math problem. This worked on her counting, numeral recognition (something she has had a little trouble with in the past) and remembering what the addition and subtraction symbols mean. Before I make something,-- like these truffula trees-- to use for an activity, I always think about whether or not it is something that we will use again, and whether it will be worth the time it takes to make it. I knew these would be a hit because I made them several days before we used them, and the girls kept asking about them and begging to use them. By the time I was ready to do the activity, Lena was so excited that she finally got to play with them. After we did several math problems, I let the girls have free play time with them, and the spent a good 15 minutes planting their new 'flowers' and playing 'magic wand.' These are for keeps! Lena sounded out the names of the trees in our yard as part of our leaf rubbing activity. Maggie is working on learning her letters, and loved reading Chicka Chicka Boom Boom! To help, I used one of our Melissa and Doug alphabet puzzles. I pulled all of the letters out, and then helped her find the correct one as we slowly went through the book. She knows a handful of letters, and is eager to make progress! This week was full of great science discussions. As we hiked and identified the trees in our yard, we talked about the names and purpose of different parts of trees (roots, bark, branches, stems, leaves, veins). We talked about how trees are good for the environment and how they breathe in the CO2 that we breate out, and we breathe in the O2 that they breathe out. We also showed Lena our Audobon Society Field Guide to Trees, and read to her the descriptions of the trees we came across. 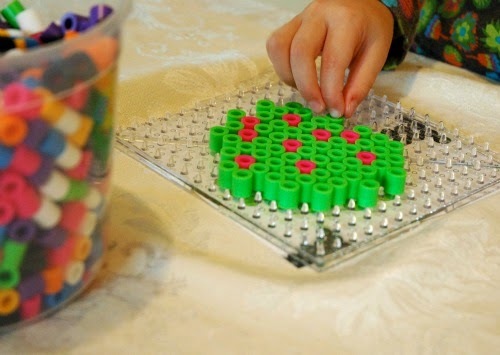 When I was a little girl, I loved the Perler plastic melty beads that you put on a little pegboard and then ironed to fuse them together. I must have made dozens and dozens of coasters for my poor family! I had been excited to introduce them to my girls, but knew they needed a few more years of motor development. Then I saw a bucket of these Biggie Beads and knew that the'd be perfect! They're just the right size for little hands! Best of all, the Perler website has tons of patterns that you can print. 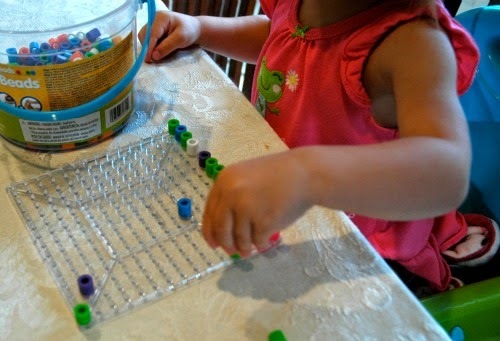 We have a bucket of beads and 2 pegboards, and use them all the time. Lena can follow a pattern easily, and made an apple tree this week. Maggie just puts the beads on the board (but told me she was making an elephant). It is great fine motor practice for both of them! The girls watched The Lorax one evening after dinner. They've seen it before, and Lena at least understands the message of the importance of trees and taking care of nature. This tied in nicely with the truffula tree math activity we did later. 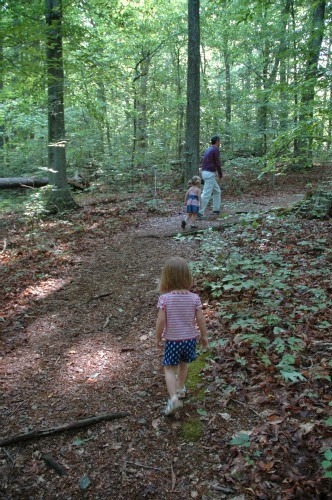 We took two wonderful trips to nearby hiking areas this week. 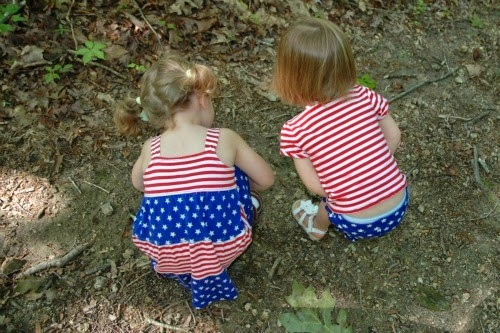 On Memorial Day we went to a University operated arboretum and enjoyed a nice little hike. As it was an arboretum, there were signs identifying many of the trees. We then used the Audobon guide to read more about them to Lena and Maggie. Later in the week we went to an 'urban wilderness' area in our town. There are wonderful trails, with informational signs along the way. Lena learned about the different environment and animals of the canopy, understory, and floor of the forest. This was a fun weekly theme, and we ended up with more than enough to do to keep us busy. 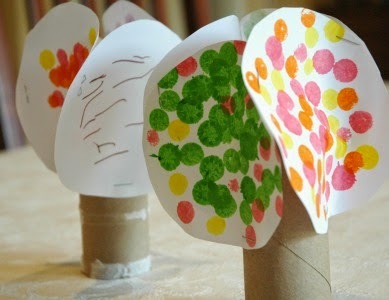 If you'd like more ideas for a tree themed preschool week, visit the Cutting Tiny Bites Pinterest board below. 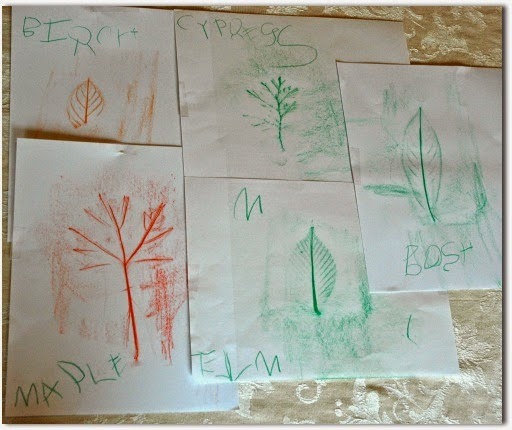 Storytime Trees from What Do We Do All Day? 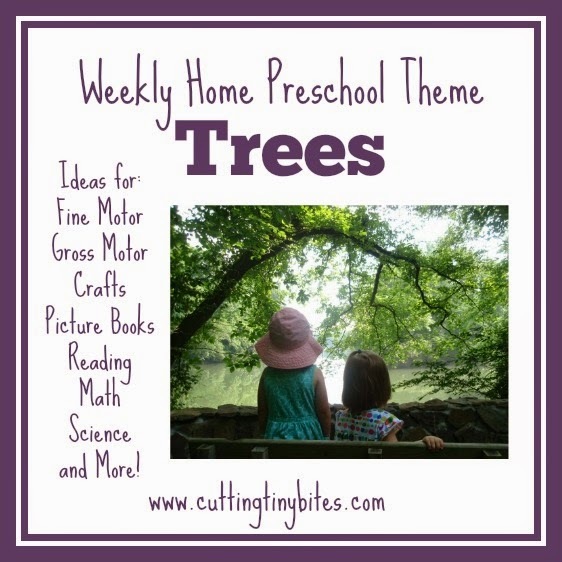 Tree Theme Weekly Home Preschool. 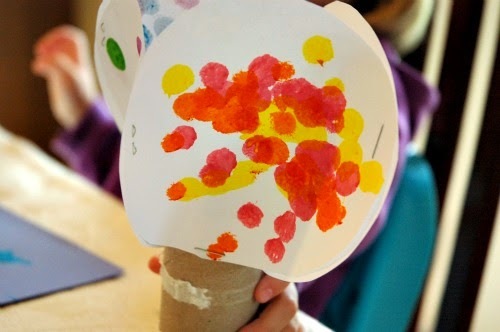 Crafts, fine motor, picture books, science, math, snack and more! Perfect amount of activities for one week of EASY home pre-k.